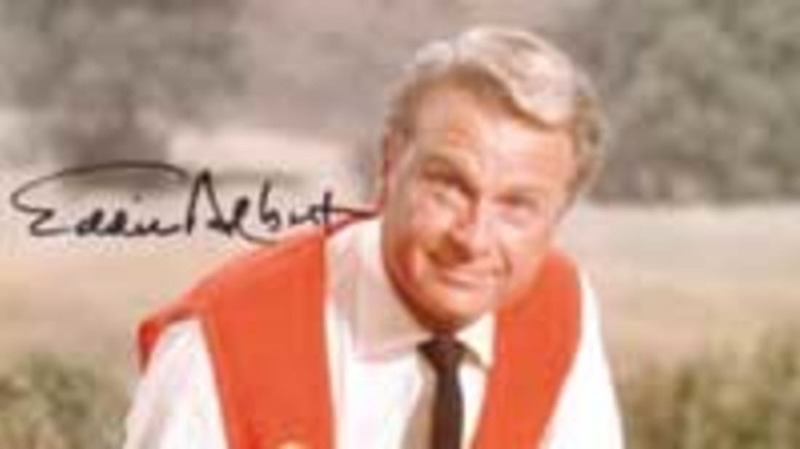 Most of us probably hear the name "Eddie Albert" and immediately think of the hapless gentleman farmer he portrayed on TV's Green Acres. Despite having appeared in over 100 motion pictures and a dozen Broadway shows, he'll always be remembered as Oliver Wendell Douglas, a role he played for only six of his 99 years. But it was the role he played offstage for most of his life that led to April 22 (his birthday) being designated Earth Day. During the early 1970s, Albert had a regular workout routine that consisted of jogging to the beach near his Southern California home and then taking a swim. An avid birdwatcher (he'd bought his first Audubon pin at the age of six), he was very familiar with the various species native to his area and their habits. When he noticed an absence of baby pelicans one season, he investigated and found out that thousands of pounds of DDT (a pesticide) had been pumped into Los Angeles-area sewers by a single chemical company. DDT is fat soluble and has a half-life of eight years, so as it was absorbed by anchovies and other fishy favorites of the pelican diet, it eventually affected their reproductive systems. Mama pelicans laid eggs with such thin shells that they crushed and broke when she tried to incubate them. Albert asked NBC for a few moments of air time to address the harmful effects of DDT, and shortly after the broadcast he was invited to speak at three universities on the subject. Three years later, the U.S. government banned the use of DDT. TV Guide once described Albert as an "ecological Paul Revere," to which the actor responded, "Ecologist, hell! Too mild a word. Check the Department of Agriculture; 60% of the world is hungry already. With our soil impoverished, our air poisoned, our wildlife crippled by DDT, our rivers and lakes turning into giant cesspools, and mass starvation an apparent inevitability by 1976, I call myself a human survivalist!" (You can almost hear the fife playing in the background.) He'd been traveling the world since the 1950s and meeting with experts in various fields (including a trip to the Congo with Albert Schweitzer to study malnutrition) and he passed his findings on to the public via interviews (in such high-profile venues as The Tonight Show) and university lectures. Washington finally decided to designate one day per year as an "environmental teach-in" (hey, it was the late 1960s, everything was an " "“in"). When Earth Day was inaugurated in 1970, Albert was one of many celebrity guest speakers on hand to help launch the festivities. Even though Mr. Douglas' crops were always pretty sickly on Green Acres, Eddie Albert had a green thumb. He remembered the victory garden his parents had planted during World War I and at a young age fell in love with the idea of growing things. He studied organic farming methods before it was fashionable, and the front yard of his Pacific Palisades home stood out from its neighbors "“ instead of a manicured lawn, there were cornstalks, tomato vines and other vegetables flourishing. He learned and warned about the danger of topsoil depletion (which became his next crusade after the successful DDT ban) and also established City Children's Farms, a program for creating gardens in inner-city areas. Hungarian-born Eva Gabor, Albert's Green Acres co-star, never quite understood his activism. "Every time a fish gets sick, you're off making a speech," she once remarked to him. He eyed the $5,000 feather-trimmed negligee she was wearing and replied, "I'd appreciate it if you wouldn't wear things like that on camera. " "But it's so chic," she protested. Albert told her that because it was so chic, women in the audience would want to emulate her style, causing the death of X amount of birds just for their fashionable feathers. "Eddie, feathers don't come from birds," Eva reassured him. "They come from pillows, dahling! " Despite not seeing eye-to-eye on environmental issues, Eddie and Eva remained close friends long after Green Acres ended. The pair are even buried very near one another in Westwood Village Memorial Park Cemetery. During a 1996 interview, Albert was asked which of his accomplishments he was most proud of. He pondered a moment and then admitted that he never thought he'd been as good as he could have in any of his acting roles. When all was said and done, he chose his World War II service as his proudest moment. As a Navy lieutenant, he fought at the three-day battle of Tarawa in the Pacific Theater in November 1943. Piloting a Higgins boat under heavy fire, he helped to rescue over 70 wounded Marines off the island and out of the lagoon who had been left behind. He was awarded a Bronze Star for his heroism.